SIZE: 8-11". Giants and Super Giants are at the top of this range. Average adults are about 50-75 grams. Giants can get up to 120 grams and Super Giants can get to 150 grams. The largest known Leopard Gecko is 170 grams and 11 1/2 inches long. LIFESPAN: Leopard Geckos can live 15-20 years, possibly longer if kept very well. TYPES OF SETUPS: Leopard Geckos can be housed in Glass or Acrylic Terrariums or Tubs of some kind. A 10 gallon tank works fine for one gecko. Glass/Acrylic Terrariums are great for naturalistic setups or if you house a small amount of Leopard Geckos. Tubs are good for rack systems when you have a larger collection. THE TERRARIUM:Inside the terrarium you need a couple different things. These are substrate, hides/decorations, a water bowl, and a heating element. Substrate- Substrate means the bottom or bedding of the enclosure. You can use paper towels, slate/tile, sand (be careful what type), or repti carpet. Paper Towels- Paper towels are among the easiest substrates to use. Simply replace them once a week. I use this substrate and have had no problems with it. Although it doesn't look very natural, it is the main substrate breeders use for tubs and racks. Slate/Tile- Slate and Tile is a great substrate for naturalistic tanks. It absorbs heat well, looks nice, and is very easy to clean. A lot of people use this for naturalistic setups. Most breeders do not use them for racks, as buying a lot can add up fast, unlike paper towels which are cheaper. Sand- There has been a lot of controversy about this substrate. If you want to use sand I highly recommend not using calci sand. Most pet store employees will tell you that it is a great substrate because the Leopard Geckos can lick Calcium as needed. But Leopard Geckos cannot digest that sand properly; it gets stuck in their system causing impaction, which ultimately leads to death. If you insist on using sand, use play sand. Repti Carpet- Repti Carpet has it's ups and it's downs. It looks better than paper towels, but Geckos can get their claws and mouth stuck on it when they are hunting. I have used this substrate before, but now since I have a larger collection I use paper towels. Do not use these following substrates: Ground Walnut Shells, Wood chips, Calci Sand, Aspen Bedding, or Vita Sand. HIDES/DECORATIONS: Hides/Decor are a must. Their should be one hide directly above or below (if you are using a lamp) the heating element (warm side). Many Leos like to rest here to get heat. There should also be one on the cool side so your gecko can feel secure without getting heat. Humid hides are hides that contain more moisture than the rest of the terrarium. They are optional for staying in the tank all the time but should be used when your Leopard Gecko is going into a shed. Leopard Geckos don't usually climb so a climbing place is not necessary but it can be used for a naturalistic setup. WATER: Leopard Geckos should be provided with a clean water bowl at all times. This can be placed in the middle of the terrarium and should be cleaned and refilled daily. It shouldn't be so big that it raises the overall humidity of the enclosure. Humidity should be around 35-55%. Getting a hydrometer is a great idea. HEATING: Heating devices can include Under Tank Heaters (UTH), Lamps, Ceramic Heaters, Heat Tape, or another kind of Reptile related heat source. DO NOT USE HOT ROCKS. These get WAY to hot and will quickly burn your gecko. Make sure you have a reliable thermometer to correctly measure the temperature. Under Tank Heaters- Also known as UTH for short, Under Tank Heaters are, in my opinion, the best heat source for your geckos. Geckos need belly heat to digest their food properly and these heaters go under the tank to send heat up toward their belly. Although these heaters are great they are not the best choice for rack systems because if you have a large collection, UTH's can get expensive. Lamps- If you use lamps, they should be used with UTH's. Leopard Geckos need belly heat to digest their food, not heat from above. You might be thinking that in the wild they get heat from the sun from above but the sun heats up the clay/sand mix and they lay on that. Lamps should only be used if your UTH does not get the warm side to the proper temperatures. If you do use a light, don't get a bright white one because they can hurt your geckos eyes. Lamps can also dry out the tank and make it harder to maintain proper humidity. Ceramic Heaters- Ceramic heaters are like lamps but they don't give off light. As with lights they give heat from above and should be used with a UTH if at all. They give off an even distribution of heat. Heat Tape- Heat tape is good for rack systems. It gets very hot so it needs to be controlled on a thermostat. It is very cheap in price, so many breeders buy a lot of it for a low price. It goes under the tank and will aid in digestion. TEMPERATURE: Temperature is a very important factor in keeping reptiles. A thermometer is a must. Leopard Geckos need thermoregulation, meaning that they need to be able to move between hot and cool temps easily. During the day, temperatures on the warm side should be 90-95 degrees, 97-99 degrees being the maximum. Cool side temps should be about 70-80 degrees. Your room temperature is the cool side temperature. So unless your room temps are very cold or warm you do not have to worry. If they are too cold, you may have to get a small lamp to heat it up a bit, while still maintaining the humidity. FEEDING: Food that can be offered to your Leopard Geckos are Crickets, Mealworms, Superworms, Wax Worms, Butter Worms, Silkworms, Roaches, Phoenix Worms, and an occasional pinky mouse. A staple Leopard Gecko diet means that you usually feed it that food source. Some good staples are crickets, Dubia Roaches, Superworms, and Mealworms. Wax worms are very addicting and unhealthy and should only be used for fattening your gecko up if needed. Only feed wax worms occasionally. GUTLOADING:You may or may not have heard of the term gutloading. Gutloading is simply feeding healthy things to your feeders which eventually go to your geckos. Good gutloads are vegetables like carrots, spinach, lettuce, etc. Dog food is acceptable. There are also some specific products for gutloading which are great. 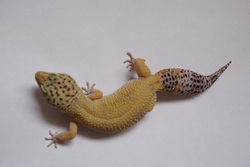 SUPPLEMENTS: Your Leopard Geckos should always have a small dish of Calcium without d3 in the tank. Feeders should be dusted with calcium d3 once or twice a week. You can also use other commercial herp vitamins, just make sure you know how often and how much to use them. Daily Care: Once a day you should make sure your leos have fresh water, feed your gecko, and regularly check the temperatures. That is pretty much it and as you can see, Leopard Geckos are easy to care for. Cleaning: Clean your geckos tank once a week. Change the paper towels, boil hard hides and decor every few cleanings to get rid of unwanted bacteria, and clean the tank as a whole every so often. The following are ranked out of 10, 1 being the worst.